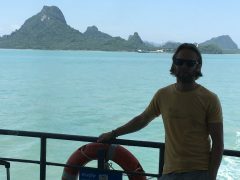 Tales of thirty-something, wannabe backpacker: Thailand part 2 | Rrampt. There are two inevitabilities for me traveling abroad: waiting in airport lines and getting sick. I hate airports, plain and simple. They’re sterile and uninspiring. There’s always a line to wait in in the byzantine rat-maze we’re forced to shuffle along through showing our passport to fifteen different people along the way who all look sternly at it and nod us through. And I hate getting sick. But it happens every time I leave the country. On my last two trips it was Montezuma’s Revenge after Honduras and crazy fever in Ecuador. And of course it happened in Thailand. But it was only diarrheal and it only lasted four days. I didn’t let it slow me down. Well, actually I can’t lie – it did slow me down a little. I mean, can you ever truly relax when you have to be conscious of where a bathroom is at all times? 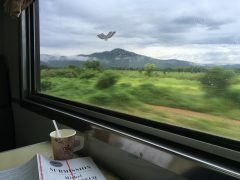 Because we had spent so much time in airports/airplanes getting over to Thailand, we decided to take a night train up to Chang Mae in the north. It was to kick off our northern tour before hitting the islands in the South. But as we sat for our final dinner in Bangkok, we saw a familiar face: Margot, the Dutch teacher who we shared a bus with from the airport. She asked to join us and introduced her friend Rabea, a mid-twenties German girl we would meet up with later on the backpacker’s circuit. Unfortunately, we wouldn’t see Margot again, as our routes were always just a few days out of synch. 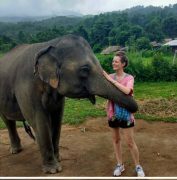 We would also meet Claire that evening before hopping on our night train, someone who will pop up again in these tales of Thailand. 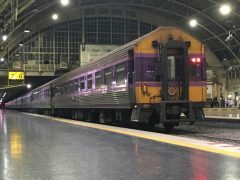 So, just half an hour before we were to leave Bangkok for our train, we’d meet three awesome travellers that could have formed a great backpacking group. Bad timing I guess, but the ticket was already bought. We had purchased it earlier that day from a young guy at a local travel agency, and just after we had paid him for the tickets and negotiated a lower price (something we were getting better at), he all of a sudden pulled out a small bag of weed and asked us to smell it. Then he offered to us for free. We looked at each other and quickly refused. Here’s why: I had been warned about these types of scams before leaving. Someone will sell you a bag of weed for a ridiculous low price (in this case nothing), and then they will signal to a nearby police officer that you’re carrying it and the officer will search you and tell you your going to jail. This is where you bribe the officer $200 US dollars and he let’s you go. Then he gives a kickback to the person who ratted you out. Great way to make money off clueless tourists, right? Not us. We didn’t fall for it. We would later hear a story about another Canadian who refused to offer the bribe and was now waiting three months in prison for his trial. Neither Paul or I wanted to be making that phone call back to Canada. We told that kid to put his weed right back into his underwear or wherever he was stashing it. So we left on the night train and it rattled its way through the darkness like a plane in heavy turbulence. I didn’t sleep a wink in my air conditioned sleeping bunk. But when morning came and the sun released light onto the landscape, I was in awe. It was beautiful. Exactly what I had imagined. Chang Mae, on the other hand, was not what I had imagined and after spending two days in the rain, and getting our iconic pictures taken at the Tha Phae Gate, we left for a place called Pai that both Margot and Rabea had raved about. Now, Pai was a little slice of heaven. We planned to stay for two days and stayed for five, a common occurrence from talking to others. Pai is a little ‘hippie’ village that isn’t hippie at all anymore. Maybe hipster with all it’s young Europeans there on holiday to rent scooters, drink cheap beer and walk the narrow streets full of nightly vendors selling delicious food for next to nothing. Upon arrival, we tried to stay at the popular Common Grounds Hostel, but it was all booked up. As we were leaving a kid said “Hey, you’re Canadians! I see the MEC on your packs”. Connor invited us to come back later to hang out with his crew to play some drinking Jenga. When we arrived back that evening, it was clear we were the oldest people there and the average age was 21. But we had fun. We were surrounded by Canadians for the only time on our trip. We wouldn’t meet another one until our last day. We would see Connor and Harrison, two of the Canadians we got to know a little, around Pai over the next few days and while they weren’t exactly ladies men, they had joined with two tall, gorgeous blonde Dutch girls and I was happy for them, but I couldn’t quite figure out how these two short twenty year old Canadian kids managed to convince them to hang. 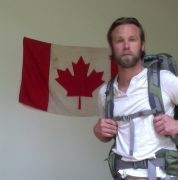 The great Canadian charm I guess. I think I used to have that. This was the beginning of a pattern: Paul would sketch someone and in return they’d give us something and I would benefit. I was beginning to like this routine. Our favourite hostel in Pai was an out of the way hippie-guesthouse called Paradise with the chill-est hangout area I’ve ever seen with sleeping mats, hammocks, murals and picturesque common grounds. An artist’s dream. Paul was in his element helping younger artists to work on murals and sketch people as they lounged around in serene contemplation after drinking the popular shroom shakes that were available all over Pai. It was a very different place tucked away up in the valley of the northern hills. 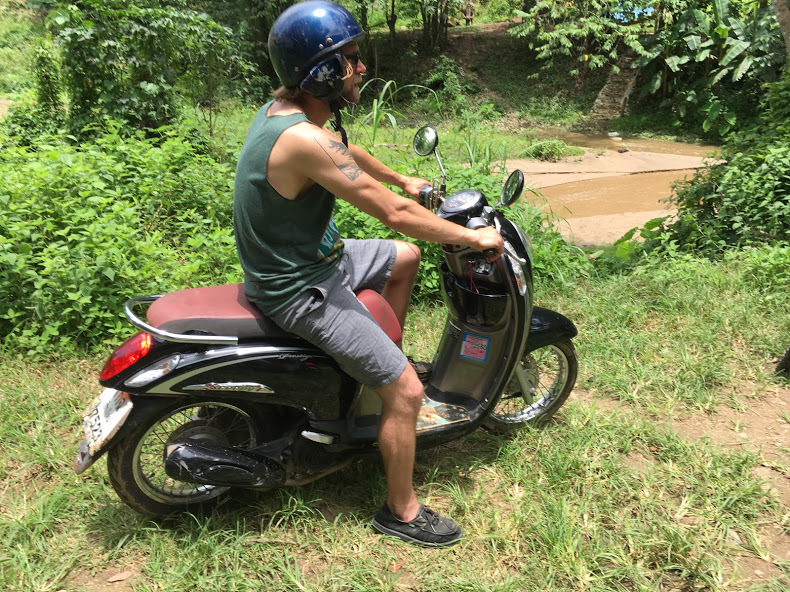 Days were spent on scooters through the rolling landscape visiting waterfalls, hot springs, and secret hangouts in the jungle. Can you find Paul under the waterfall? The entranceway to our favourite bar in Thailand. Pai is a place where you could get a meal of three tacos and a beer for under $4. Sushi was 10 cents a piece. This is where you would see constant streams of beautiful, young Europeans concentrated within a mile’s radius walking and laughing and enjoying the laid back Thai lifestyle. When everything closed at 11pm in the village, the party moved across the river to Don’t Cry bar where fire dancers stole the show, balancing on tight ropes and juggling sticks of flame. If you got too hot by the fire, you could walk down the road to Sunset Bar and take a dip in the pool. Most places paid the cops to stay away so they could sell their ‘shakes’ in peace, but once in awhile the owner would shut off the lights and tell everyone to get out, NOW! I guess it wasn’t a perfect system. After a few days, Rabea sent me a message saying she was on her way to Pai and when she arrived, I picked her up on my scooter from her hostel across the river and while it might have been considered a date, I couldn’t shake the feeling that she was more of a little sister to me. She was beautiful with extraordinary German features that framed a high-cheek-boned face and soft round eyes. But there was an innocence to her that made me feel like an older brother keeping a protective eye on her as bartenders tried to hit on her throughout the night. She was new to traveling and doing it alone and I felt compelled for some reason to make sure she made it home safe. Paul joined us for dinner at an upscale restaurant and we all drank our way towards the edge of town until we ended up across the river at Sunset dipping our feet into the pool until the police were on their way for some reason and the hundred guests were all forced out into the rain. The next day we took a bus back down through the mountains and flew from Chang Mae to Surat Thani to kick off the southern leg of the trip. We both wanted to stay in Pai for longer but our flight was booked and it was time to lie on some beaches for awhile and get a tan. While we loved Pai, it rained often. 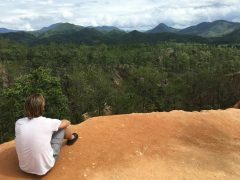 We had one night in Surat Thani before taking the ferry from Don Sak Pier to Koh Samui and one night in Surat Thani is really all you need. It’s a working class town and not a place set up for tourists. The hostel was nice, but outside of that, there were none of the luxuries we were used to in Bangkok, Chang Mae, and Pai. We bought a bag of grasshoppers from the night market and snacked on those until we wandered into a restaurant that didn’t see too many Westerners. The only thing in English on the menu was boiled chicken, and I thought ‘Well, that’s just about as safe as you can get.’ I pointed at that and Paul took a gamble and pointed at something in Thai. We both recognized the Chang in the fridge at least and took one each. When the food arrived, I dipped into a bowl of the spiciest chicken soup I’d ever had. I thought my tongue was going to dissolve. Paul got a plate of what looked like calamari, so we decided to switch meals. He wanted the spice and I wanted the seafood. It was only after trying it that I realized it wasn’t seafood. When the owner pointed to his stomach and said pig, I realized I was eating pig intestines. Grasshoppers and pig intestines: one of the more interesting meals I’ve ever had. It wasn’t long after that I got some interesting action in my own intestines/GI tract that lasted for a few days. This is the sickness I mentioned. It came on at 4am the next night and I thank the sweet lord I was staying in a decent guesthouse that supplied toilet paper. Some did, some didn’t, and when you needed it, you hoped you were in a place that did. Albeit, every toilet did have a hose next to it, which I only assumed was a makeshift bidet, but never actually had the guts to use. 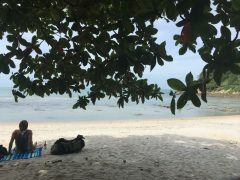 When we arrived by ferry to the island of Koh Samui, we rented scooters again and made our way to Lamai Beach to meet Claire-Bear, the South African (who wanted to be known as American) that we had met in Bangkok a week before. We checked into the Grand Thai Resort that she recommended and by coincidence ended up in a room next to hers. When she met us at a restaurant for dinner and drinks, we had no idea the long night we were in for. We got Claire-Beare-d that night. She knew how to party. She took us along the strip from Aussie bars to karaoke dives to outdoor go-go clubs where women danced around poles and Mama-Thai played us in Connect-Four (she was the only person to ever beat Paul apparently). But all along the way, Claire kept secretly ordering JagerBombs and Tequilas to our table so they would just constantly appear. I’ve done my fair share of JagerBombs (we named our soccer team the JagerBombs in Australia for obvious reasons) but it had been many years since I’d downed a wack of them in one night. In the morning, you feel your heart doing weird things. When the night was finally starting to wind down, we grabbed some Changs from the store, moving deftly around the Thai hookers sprawled out seductively on their scooters in front of 7/11 and went back for a dip in the pool and swapped some travel stories. Claire told us that she had been infamous for awhile in England after she flashed the camera at a Premiere League game and the video went viral on Youtube. Paul and I searched for it later but had no luck. Anyways, we woke up the next morning feeling horrible, just terrible. I haven’t been that hungover in a long time. We had to get out of there. We couldn’t handle another night in Lamai with Claire’s thirst for tequila and Jager. So we ran away. We checked out, jumped on our scooters and drove up the northern tip of the island where we stumbled on a secluded beach and quiet resort that was struggling during low season and offered us half price bungalows. We agreed to the price and spent the night recovering. Sometimes you just gotta run away to a secluded beach in Thailand to recover from the sinfulness of the nightlife. But that wouldn’t be the last time we’d see Claire and get sucked into a night of heavy drinking. Oh no, we’d get Claire-Beare-d again in Koh Pangan where buckets flowed like water.